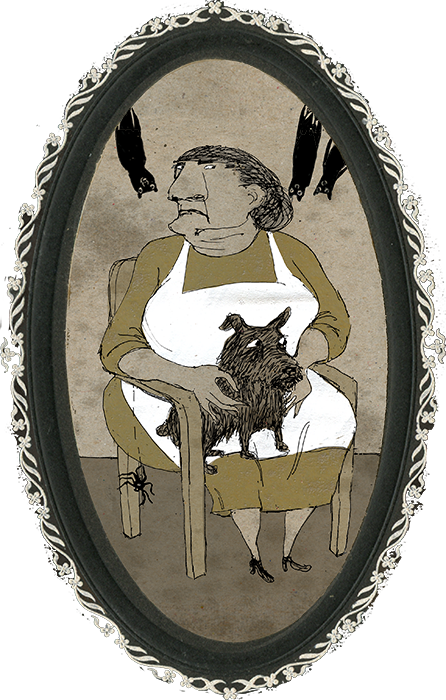 Grunhilda the Black Heart is a witch by trade, but owing to circumstances beyond her control (namely the sharp decline in the number of evil stepmothers), she no longer earns her living by magic. Today, she is a lunch lady at Salem Elementary, where she enjoys tormenting children with food. She lives in Salem with her familiars.Mr. Williams is a rather nervous fellow, having never fully recovered from the fact that he is now a dog and not a tax accountant. The Bat Boys are much happier as bats than they ever were as children, although it’s hard to be certain that they know they are bats, as they are undeniably dim. Louise was actually born a spider but spent nearly 100 years as a human. She always tells the truth. This information is secret. If you are a bit of a blabbermouth, I suggest you visit the amnesia potato.